Natural Weigh Ltd is a zero waste shop in Crickhowell selling high quality dried foods, cleaning products and lifestyle products to help people on their zero waste journey. Its mission is to reduce single use plastic by offering customers a chance to shop without packaging. Customers bring in reusable containers to fill with products from the shop. Everything is sold by weight, which means people can buy as much or as little as they like. It also works towards making the business as sustainable as possible. It is powered by Ecotricity which use entirely renewable energy, and the only waste sent to landfill is the sellotape from packing boxes. It supports over 10 other small independent businesses based in the UK, with many of them within Wales. This keeps its carbon emissions low and keeps money in the local community. Its aim is to have as little environmental impact as possible. It operates in the bustling rural town of Crickhowell, which is a haven for small independent shops offering local people (and those from further afield) the chance to shop on their high street rather that at a supermarket. Aria Bridal UK is an innovative, sustainable bridal label for brides who dare to be different. Each one-off design is created in direct collaboration with the brides, by designer maker Helen O’Sullivan in her home-based studio in south Wales. All of the designs are then made using sustainable materials such as hemp, organic cotton, organic silk, bamboo and upcycled/reclaimed materials. Even the threads used are organic cotton. The additional unique selling point of designs is colour: Each design can be dyed in a range of colours using azo-free dyes or 100% natural plant-based dyes. As Helen works as the designer/maker she is able to control the sourcing of her materials and ensure they are from responsible and sustainable sources. The majority of fabrics are from the Organic Textiles Company, a Welsh company that works directly with its partners in India and other countries to ensure farmers, weavers and workers are paid fairly. The cotton she uses is GOTS certified. She also works with a small family owned factory in Slovenia which creates organic cotton lace which is also GOTS certified. At the end of life gowns can be transformed into dresses to wear again. The Anglesey Cider Project was created to make use of many apples on Anglesey that were going to waste each year. A plea went out via social media in September 2016 asking the people of Anglesey to donate their unwanted fruit in exchange for an allocation of cider the following spring. An encouraging response enabled the launch of Jaspels Anglesey Craft Cider as a brand in June 2017. Its logo was inspired by collecting apples from many red squirrel conservation areas on Anglesey. Jaspels encourages the planting of orchards and its aim is to grow Welsh Heritage apple trees across Anglesey. Its waste apple pomace is given to pig farmers and to Pennotec, a local business, for food research development. 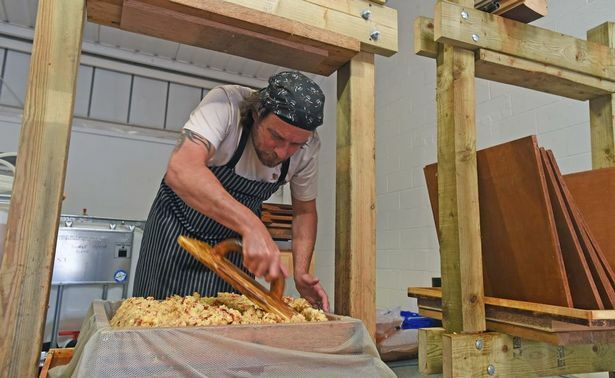 It produces its craft cider using traditional methods and a handmade wooden press and holds demonstration days and a visitor facility boosting tourism in the North of Anglesey. In 2018 it increased volume as it had five times as many donors and has since secured more apples using supermarket rejects. In 15 months it has developed into a recognisable drinks producer in North Wales and has recently added the slogan ‘less waste more taste’ to its products.